Emotional Freedom Techniques, Tapping, EFT? My first reaction to EFT was to reject it out of hand. Like me you are bound to be sceptical. How can tapping on your face make any difference to your behaviour, thoughts and feelings? There are extravagant claims for EFT all over the internet and the hype can be off-putting. If you’ve come this far you must be curious so please read on. I’m so glad I persisted because in my experience EFT really does work. I’ve seen so many people get free of the past and create joy in their lives. I’d like to give you straight forward, common sense information in everyday language and you can draw your own conclusions. An experience is better than an explanation. Lets start with an example. Sue kept away from windows in tall buildings, she panicked on hilly roads and flying was out of the question. She could get by through avoiding any high place but now her daughter was living overseas and Sue was terrified to get on a plane. She was desperate enough to try something that looks daft, feels silly and to the rational, logical mind cannot possibly have any effect. Only it did. We tapped together for aspects of her fear till she could calmly look out of the top floor windows. So we took her up to the Ilkley Cow and Calf rocks. The vertical drop from the rocks gets to most people. Sue was calm as we drove. Climbing on to the rocks revealed more of her old problem and we tapped again until Sue looked down with confidence. “That’s me!” she said on seeing a plane. This was a long standing and deep seated fear. How did it change completely and in such a short time? Modern science can’t yet answer that question. Tapping therapy techniques began in the 80s with American Psychologist, Roger Callaghan and were streamlined by Gary Craig. EFT came to the UK in 1999. Now there are millions of people worldwide tapping. And a growing body of research. One day we will have the answer to how it works, until then you can simply try it and see if it works for you. EFT is a set of techniques that combine focused words with tapping acupressure points on the face and body. You can see Sue tapping on her collar bone. It might seem unbelievable that such tapping can make any difference. But over and over again it does. Sometimes change is quick and complete. And with more complex issues, each session is a small step in the right direction. EFT is for when our behaviours, thoughts, emotions and health are out of synch with what is actually happening. Painful memories, times of intense shock or prolonged stress, stick with us and shape our present behaviour and health. By reducing such stress, EFT can have remarkable effects. EFT can take us from re-living the past to re-telling it as just something that happened. Not forgotten but not needing to be remembered in the same way. You can learn to use EFT for yourself. You need no equipment, you can do it anywhere, you don’t have to believe in any faith system. Apart from a little expenditure for quality training to get you started, there is no cost. Many people have freed themselves from the past and opened up their lives all by themselves. 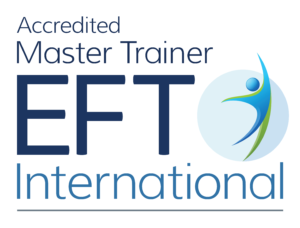 However, working with an EFT Practitioner is like having a personal trainer. Of course you can go to the gym and exercise on your own, but you’ll do more and go further with a trainer or in a class.